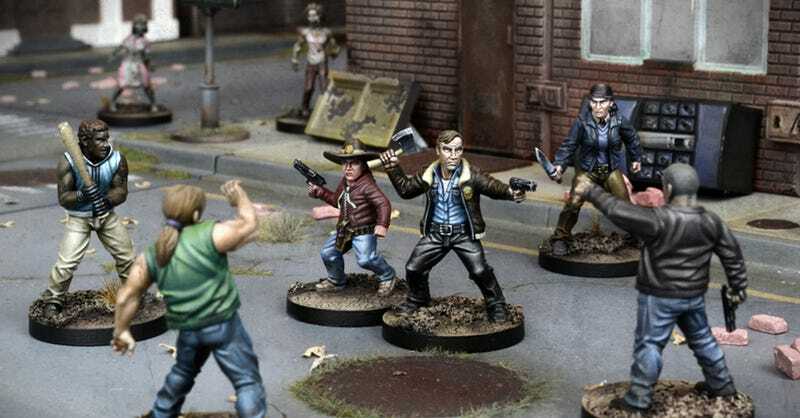 Thanks to its pervasiveness as both an incredibly long-running comic and one of the most popular shows on TV, The Walking Dead lends itself to a variety of merchandising opportunities. The least expected? A tabletop wargaming venture in the vein of Warhammer, Warmachine, or other games without “War” in the title. The Walking Dead: All Out War—named after a popular arc from the comic series—comes with the backing of Robert Kirkman and his media company Skybound, sourcing it from the comic book series rather than TWD branded by AMC. Made by Mantic Games, the game will pit groups of human survivors against one another, while zombies serve as a generic third party that throw the spanners in the works while the human groups do battle for resources and survival against the undead hordes. Rather than going straight to market, Mantic are bringing the game to Kickstarter on February 1, seeking funding for the first run and to essentially act as a preorder system. Fans can pledge more to get bonus models and extra knick knacks, on top of the $125 starter set than includes the rules, accessories, and unpainted models for you to play the game with. I wonder if there’s some sort of “endless depression” mechanic, just to capture the grim outlook of the comics, a sort of madness mechanic in the vein of Betrayal at the House on the Hill or something. Would be pretty neat! The Walking Dead: All Out War is expected to start shipping in August.